Plans for a massive, three-story underwater tunnel to connect the Asian and European sides of Istanbul by both rail and highways are now in their 'final phase', Turkey's transport and infrastructure minister said on Thursday. 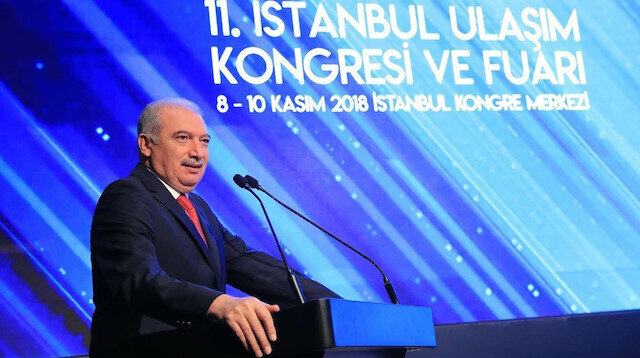 "We will break new ground by building the three stories in one tunnel," Mehmet Cahit Turhan said at the Transist 2018 Istanbul Transport Congress and Exhibition. The 6.5-kilometer tunnel, which will be 110 meters under sea level, will have one two-way railway line and two highways, according to the Transport and Infrastructure Ministry. Turhan said the tunnel would connect nine different railways used by 6.5 million people daily, with an express subway. The tunnel will also be integrated with two big subway lines to link the new Istanbul Airport and another city airport, Sabiha Gokcen, he said. "People will be able to reach Istanbul Airport from Sabiha Gokcen in less than an hour without changing trains," he added. The tunnel will also relieve traffic on Istanbul's two main bridges, the 15 July Martyrs’ Bridge and Fatih Sultan Mehmet Bridge, he stressed. He said Turkey has invested 515 billion Turkish liras (nearly $240 billion) in transportation infrastructure improvements over the last 16 years. The tunnel project started in 2015 as one of Turkey's mega projects. Completed mega projects include one of the world's longest bridges, Osmangazi, one of the world's biggest airports, Istanbul Airport, and one of the world's highest drawbridges, Yavuz Sultan Selim.